But it can't be from Dolly Clackett. She gave me an Easter egg! : Not much meat on her, but what's there is choice. Not much meat on her, but what's there is choice. It's finally Friday! A MASSIVE hurrah for that, what a week! I'm so glad to be able to have a sleep in tomorrow, I tell you what! Well, the end of my week was as busy as the beginning. I rocked up to our London office on Thursday, fully expecting an ordinary day, only to discover that I was scheduled to be in a day-long meeting. This came as quite a surprise, as I didn't have it in my diary, but I had to go so I did. It was excellent, if tiring. We met with a specialist in the teaching of blind and visually impaired children, who was going through test papers to help us to modify them to make them accessible. It was exhausting, but this kind of thing is one of the reasons why I really do like my new job - it is so interesting. After work I rushed down to Broadwick Street to meet Nic and Tom in the John Snow, as we had planned to go and see Pat and Mike at BFI Southbank. They are having a Spencer Tracy and Katharine Hepburn season, and Pat and Mike is my favourite Tracy-Hepburn movie. To my shame, I dozed off for ten minutes during the film but it was the effect of a very long day at work combined with a warm dark room! It was snowing pretty heavily when we got back to Leamington last night, so I worked from home today. I didn't want to fall over for a second time this week! I was feeling very stressed in the morning, partly because of work but mainly because I was stressing myself out. Friday mornings are pretty hectic though, as I have to phone into three meetings and take the notes. This caused me problems last week (which is why I was stressing this morning) but one of my colleagues very kindly helped me out, so although I was on the phone for three hours this morning, it wasn't nearly as stressful as last week. Nic took me out for lunch, and then I was flat out this afternoon as well. I am feeling pretty chirpy, however, because it is the weekend! 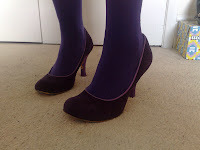 Also, because my new shoes arrived this morning and they are beautiful. I'm so glad I bought them! 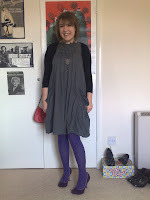 I'm also always very happy to wear my Fever asturias dress, it is so comfortable. I'm not sure why my hair is so fluffy in this picture! Nic and I are going to have a nice lazy weekend - next week is going to be pretty intense as well, so it'll be good to recharge my batteries ahead of it. I have been pretty bummed out all week, but I'm determined to leave my worries behind and be a lot more positive. Also, sucky February is nearly over - YES! Now, I'm away to cook dinner and watch Inspector Morse. I'm cool like that, you know?